CHARLOTTE, N. C. --- Filtering the hot oil in your plant to remove contaminants can minimize unscheduled maintenance that could disrupt operations and interrupt reliable supplies of asphalt for road surfacing, aggregates and roofing materials production during your busy months. Top priorities for asphalt producers during seasonal downtime are Preventive Maintenance (PM) and upgrades to their plants to assure an uninterrupted supply of product from hot and warm mix plants during the busy road building season. One easy way to implement PM is to install a heat transfer fluid filtration system. These systems make sure thermal oil is clean and filtered of contaminants, increase the useful life of hot oil and keep oil clean longer. By keeping oil cleaner, fouling and sludge build-up are reduced, heat transfer efficiency is increased and wear on moving parts such as process pump mechanical seals, impellers and valves are significantly reduced. "We find that filtering hot oil normally results in a three-fold increase in pump life," noted Judy Shums President of Liquid Process Systems, a supplier of heat transfer fluid filtration systems. Filtration systems available to asphalt producers from Liquid Process Systems include the patented Model SC15CF Duplex Sentinel Series Heat Transfer Fluid Filtration System and the patented Vector Series Model VB10C Thermal Fluid Filtration System. Both systems are easy to integrate within a new or existing facility, with the patented housings continuously filtering contaminants on a side stream basis down to 10 microns. Continually filtering on a side stream basis while the plant is operating keeps fluid clean for higher heat transfer and plant efficiency, longer fluid life and minimum maintenance downtime. 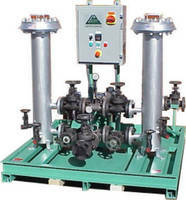 With both systems, a portion of the hot oil or thermal fluid from the main process pump discharge is diverted through the filter housing using existing hot oil heating system flow and pressure available from the plant. Clean fluid is then returned to the suction side of the pump. The Model SC15CF Duplex Sentinel Series is an automatic, stand-alone filtration system with a modular design that makes it extremely versatile and allows location anywhere in the hot oil process heating loop. The system has its own pump, filter element-loading monitor, valves, gages and control panel, making it ideally suited for facilities where existing system flows and pressures are completely dedicated to heat users. According to Shums, this would leave insufficient fluid for only a manual VECTOR filter housing. The Duplex Sentinel Series can filter up to 30 gpm (114 lpm) of hot oil at 650°F (345°C). The system can withstand up to 150 pisg (10.5 barg) of pressure, up to 33% more than the Vector Series. With its higher flow rates, system design pressures and temperature, this system can accommodate larger production facilities. Housings in duplex arrangement help users achieve continuous filtration by switching from the clogged housing to the clean filter housing while the clogged housing elements are being changed. Depending on process connections, the Sentinel System can offer portability between process loops. Another filtration system available to asphalt producers from Liquid Process Systems is the Vector Series Model VB10C. This system can withstand up to 100 psig (6.9 barg) of pressure, with a flow rate and cleaning capacity up to 15 gpm (57 lpm) or over 900 gal/hr (3,405 l/hr) at a temperature up to 650°F (345°C). This provides enough cleaning capacity to filter the entire volume of a smaller asphalt production facility several times in a typical day. To install this system, two inlet and outlet connections are made by selecting from threaded, socket weld or flanged. Life of the filter element is from 6 to 10 weeks, depending on the condition of the fluid. An optional electronic filter element-loading monitor is available. Along with asphalt producers, industries that can benefit from hot oil filtration systems include petro-chemical recycling and refineries, automotive, PET and plastics, die casting, paints and adhesives, sealants, food and supplement processing, engineered wood, petroleum, chemical, pharmaceutical, institutional and resort textile operations - anywhere thermal fluid is used in the heat transfer process. Systems are built to comply with strict ASME Section VIII, Division 1 Pressure Vessel Code specifications. For more information, contact Liquid Process Systems, Inc., 1025-A Technology Drive, Indian Trail, North Carolina USA 28079. Phone: (704) 821-1115 or (888) 786-1101, FAX: (704) 821-1190 or E-Mail: jshums@lps-filtration.com. Our web site is www.lps-filtration.com.